Quirky Jessi: Hopscotch Rug - Wipe your feet and jump a few! Hopscotch Rug - Wipe your feet and jump a few! How fun could this be? Although the price tag is too high for me, wouldn't this hopscotch rug be cool to have that in a kid's room, the garage, or even the foyer (assuming you're not too formal :P)? Rainy or snow days don't have to limit the outdoor feel and hey, at least they'll be wiping their feet as they hop down the hall. Ohhhh... we need some of the Kindergarten rug in the kids rooms. 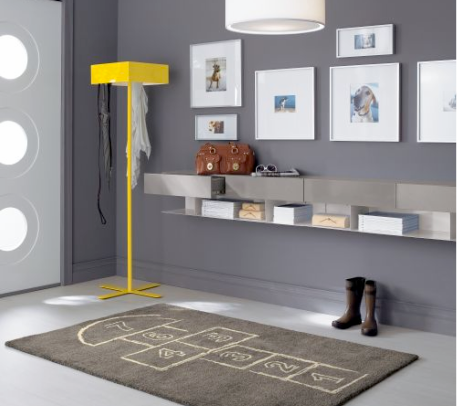 The hopscotch rug is a great idea. :)Awesome!